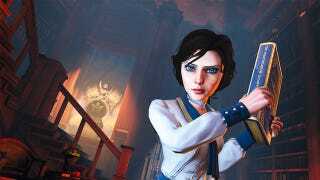 Kotaku loves Bioshock: Infinite. If you missed the slew of games and credit on offer for pre-ordering, you're not out of luck. Here are the best places to buy the game right now for all three platforms. Green Man Gaming is still offering 15$ credit or $14 cash back with a purchase of the game, which is crazy for a Game of the Year frontrunner that came out today. GMG was our best pre-order option and remains our best day one option. Plus, Steam DRM. The Playstation Store is still running their March promotion: spend $50 or more to get $10. Infinite is $60, so you see where we're going with this. Plus, no shipping costs. Rakuten has Bioshock: Infinite for on sale for $55.99 with free shipping. Far from instant gratification, but $4 goes a long way in the Steam Indie Spring Sale.